In No Jills; no playoffs for the Bills, we argued that the last few years of the playoff drought were partially due to the unfair absence of the Jills. In a way, we placed a curse; the Bills were not deserving of the playoffs until they unjilted the Jills. So yesterday I had mixed feelings. On the one hand, I wanted the drought to end, but, on the other, I hesitated lifting the curse. 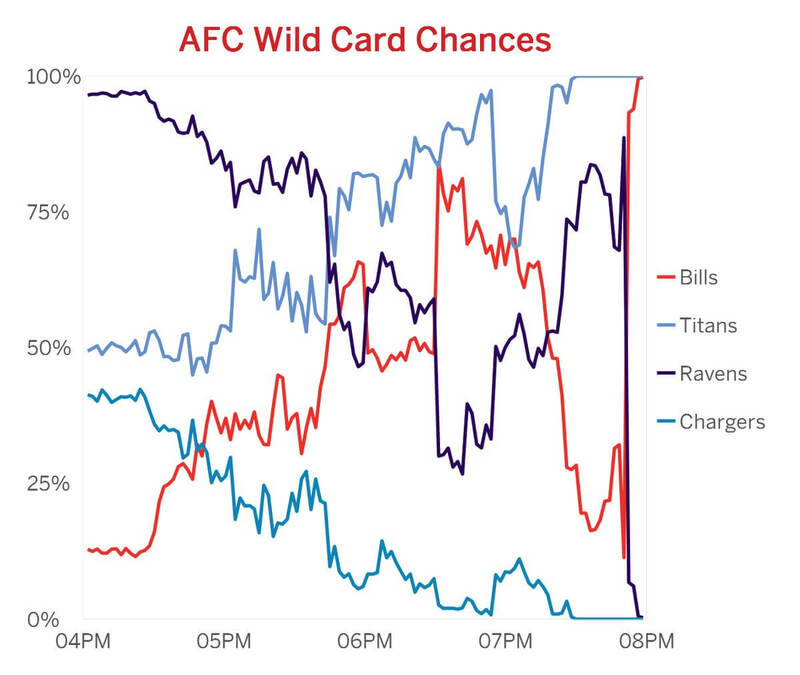 As seen in the chart, when the Chargers and Titans had won and Baltimore was leading Cincinnati 27 – 24 with time short in the 4th quarter, the Bills chances had fallen below 15%. So the Bills would likely get their just desserts. But then Cincy completed a 4th and 12 and then Andy Dalton threw a 49 yard touchdown pass. The drought was over. Sorry, Jills, I cheered. On to Jacksonville — even if the Bills are going stag to the Big Dance. I’ve decided to temporarily lift the hex which will return next year if the Bills haven’t kissed and made up with their better halves. 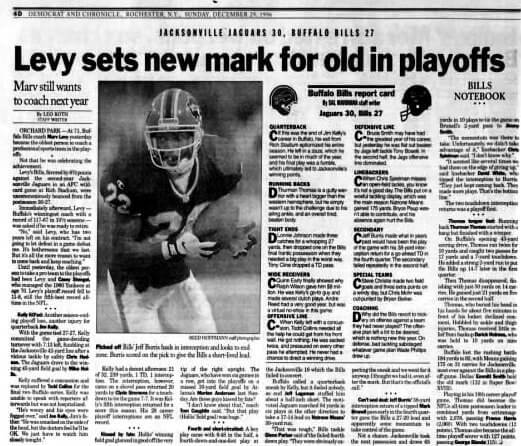 The other time Buffalo and the Jacksonville met in the playoffs was December 28th, 1996. Still having the core players from the Super Bowl runs, the Bills finished 10 – 6, and were favorites against the 9 – 7 Jaguars. But the Jags pulled off the 30 – 27 upset. The game was tight the whole way. 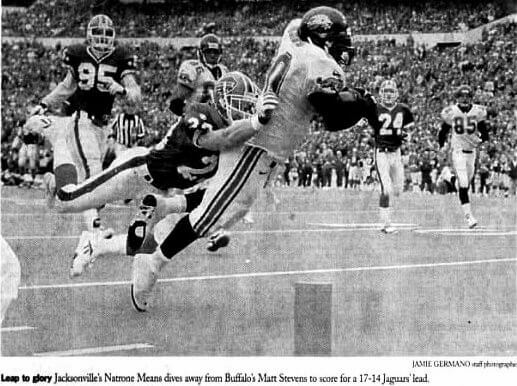 Bruce Smith had won Defensive Player of the Year, but was neutralized by the Jaguars’ young tackle Tony Boselli. With 3 minutes 7 seconds to play, kicker Jacksonville Mike Hollis’s 45-yard field-goal attempt clipped the right upright and bounced through to break a 27-27 tie. By that time, however, Bills quarterback Jim Kelly had been knocked out of the game on a hard hit by Jaguars safety Chris Hudson, and fumbled the ball. Dazed and concussed — not even realizing he had fumbled — Kelly was carted to the locker room. The 36-year old quarterback never played another down. Todd Collins came off the bench trying to salvage the Bills’ hopes, but fell short. The Bills made the playoffs in ’98 and ’99 and then again yesterday. In late December, 1996, while most of you were freezing in western New York, I watched the game in paradise. I was vacationing in Puerto Rico, mostly on the nearly pristine island of Vieques, masquerading as a civilization dropout and beach bum. Bananas. 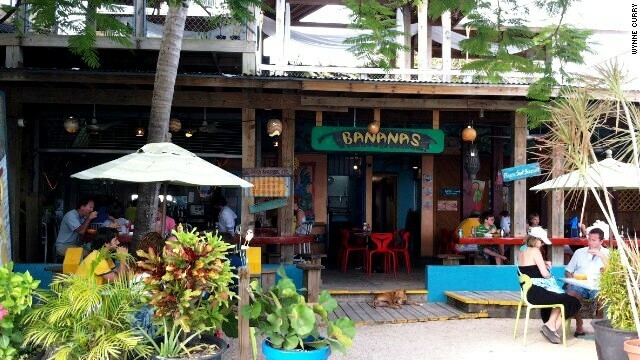 Vieques, Puerto Rico where I watched the game. After swimming and playing Frisbee on the pure white sand of Navio Beach uncluttered by tourists, I sauntered into Bananas that had a satellite dish. When Hollis’ field goal ticked the goal post and took a Jaguar bounce, I grew restless. 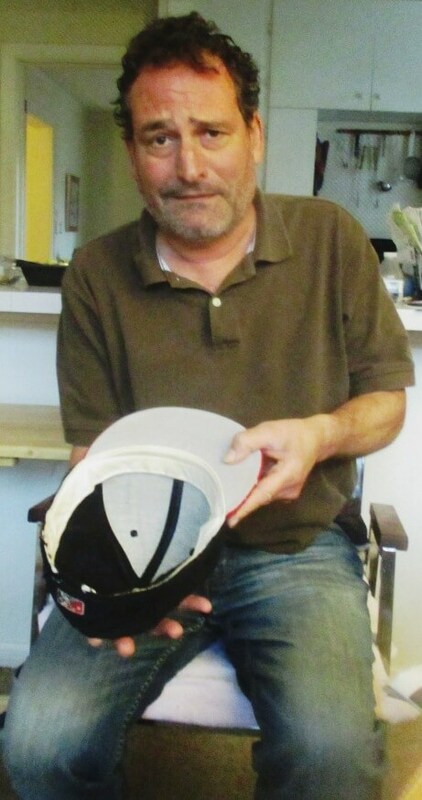 Kelly once said, “The game is played with pain,” but when he was carted off, I knew all the shots of the painkiller Toradol (“Vitamin T” to players) weren’t bringing Jim back. 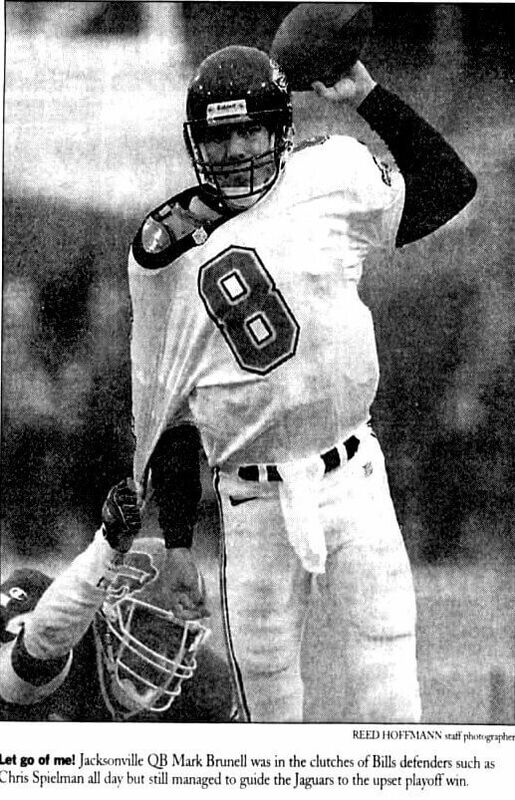 Collins tried to rally — and the Jills cheered him on — but Todd fumbled on his own 30 and Brunell kneeled down for the win. But life was good in 1996. I forget about the game as soon as it was over — there would be more playoff games — as I had hacer el amor on my mind. 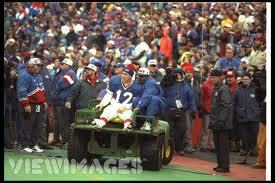 Life has been tough for Bills fans since 1999 as it has been for Talker. Both of us — until yesterday — have been down on our luck and will take whatever we can get. Remember to give the gift that keeps giving. UPDATE: The Jills ball as talisman thwarted; the curse is back. Monopoly at the Strong Museum. And the world's shortest Monopoly game.